I try to finish what I begin, but I can never seem to succeed. The one thing that I've never stopped doing once I started (aside from breathing and other life essentials) is creating and lusting after the many beautiful things that this world has to offer. I can't help but to fall in love with the whimsical clothing I see in the second-hand store windows and the near mint records I find at the bottoms of crates at the Salvation army. It is these little treasures that make the treachery day to day life a little more bearable. I find that I visit etsy.com every time I visit a computer. Even more than my e-mail and my facebook, I log on to Etsy to feast my eyes on the innovative creations of so many artists like myself. The vintage pieces that shop owners also tease me with are equally as tantalizing. My bank account may be crying due to my little splurges, but there is a bit of a thrill that runs through me every time that I find that thing that I didn't need until I saw it and suddenly realized that I always wanted a bar of soap that smells exactly like a fresh kumquat. Yes... kumquat. The high begins with ordering the item and remains until it arrives in the mail and I can tear into that little package that is labeled with my name. Etsy never fails me. It is quite a faithful friend, indeed. My etsy shop began with my attempt to sell prints of my photography. Unfortunately, prints are now flying out of stock these days, so I needed something more. That's when knitting came in to play. My mother taught me to knit a few years ago when she believed that I needed to use my time in a more productive manner, rather than wasting it watching Golden Girl reruns all day (though I now knit and watch the show simultaneously... so at least I am being creative about my TV time). Thanks to mum, I have become addicted to knitting and constantly dip into her stash to knit up something new. 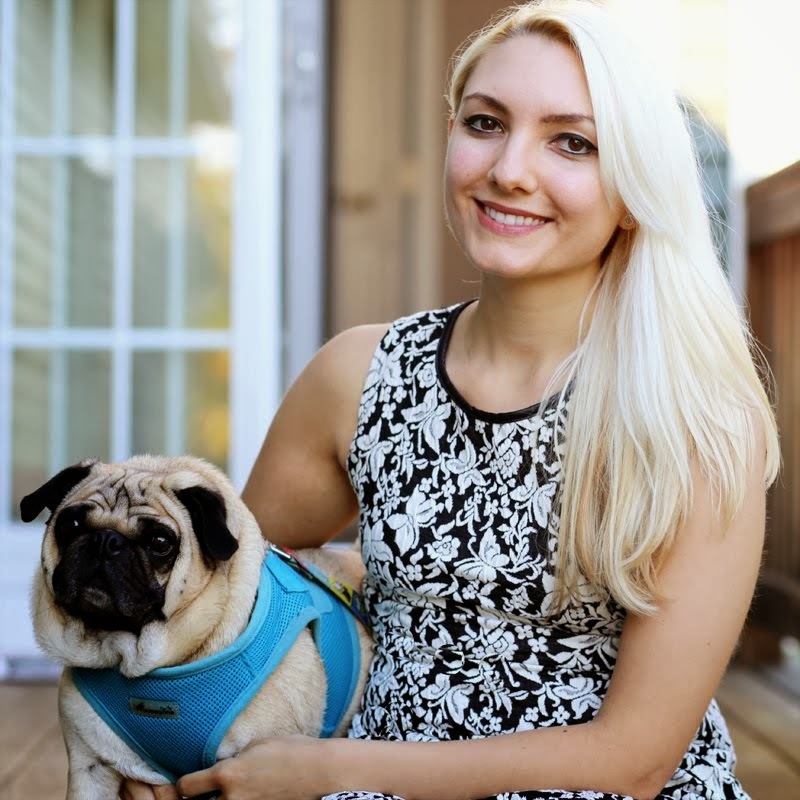 My shop is famous for The Snuggly Pug Alien Hat that is inspired by my pug, James Dean. We've now sold over 100 hats and I'm glad to see that we are keeping dogs around the world warm (we even sold one to a customer in Italy! very cool). 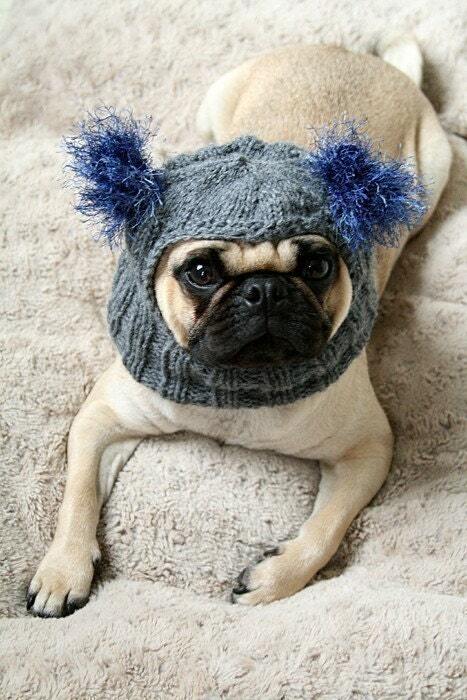 We are expanding the pug line and now make neck warmers and other hats. Who knows what's next? I love anything pop art. Who doesn't adore the stylistic influence of Andy Warhol? You can check out these cards in the shop for Trig Ink Art Studio by clicking here. 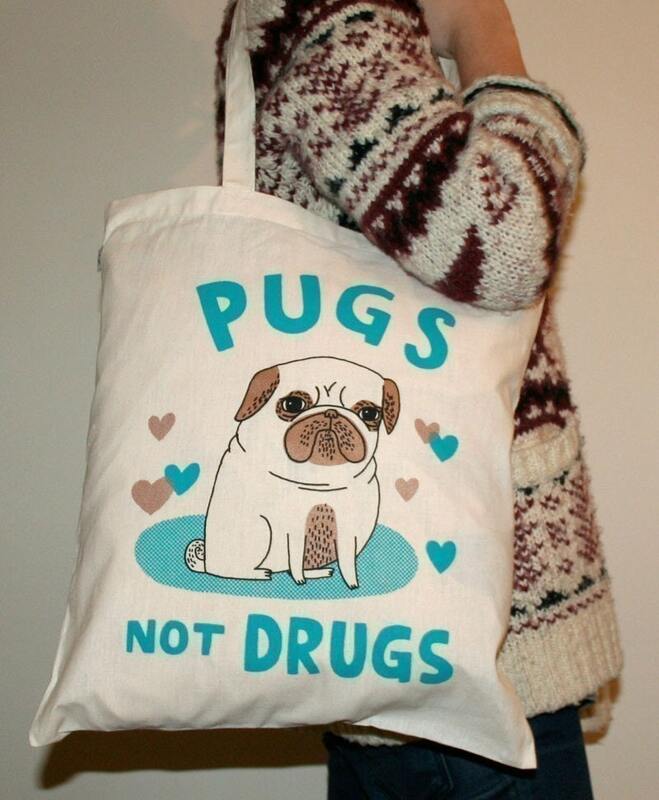 I received this cute tote as a Christmas gift and was ecstatic about it. 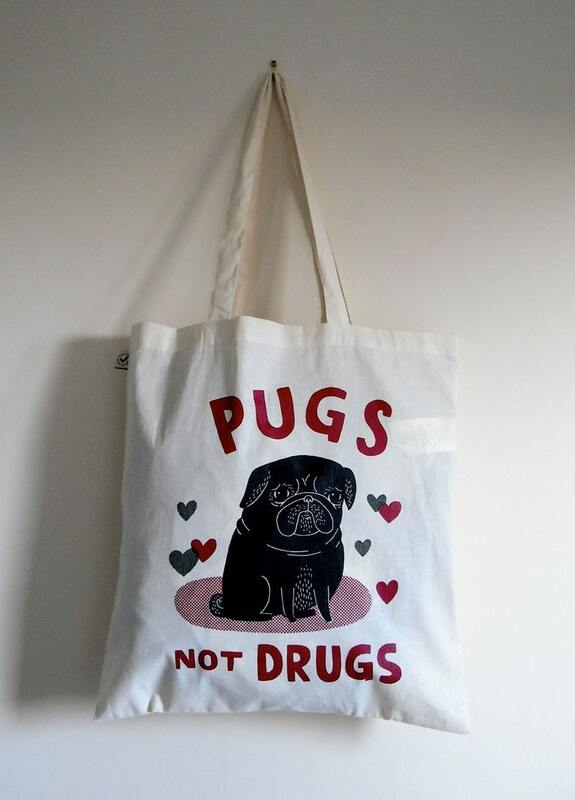 This is an essential for any pug lover. There is even one for black pugs now, too. So cute! 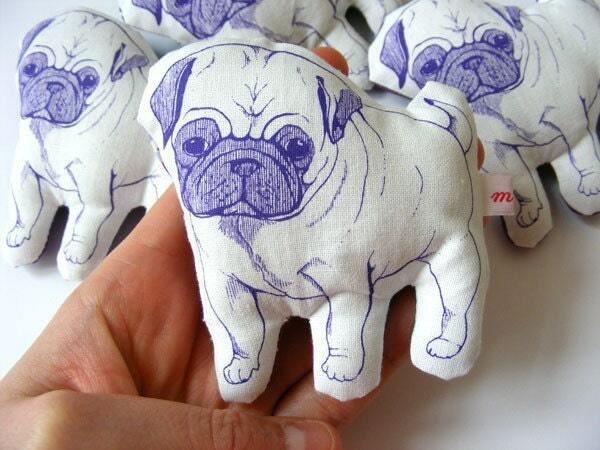 You can find it and other pug items, including pocket mirrors and note cards, in gemmabear's shop here. I grew up on a diet of I Love Lucy and Doris Day. This item reflects Lucille Ball's simple and elegant housewife style while also giving a chic style to pet lovers. This is lovely for craft fairs to house cash or in the kitchen to bake up a storm and protect your bottoms. 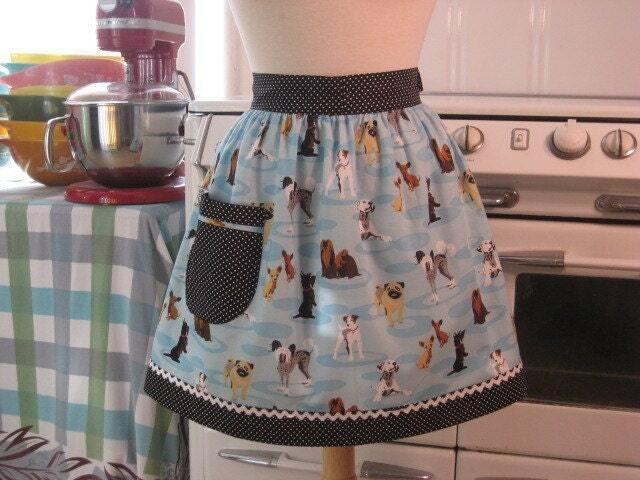 The Boojiboo shop makes these dashing little numbers in many styles and colors so make sure to peak at this apron shop. 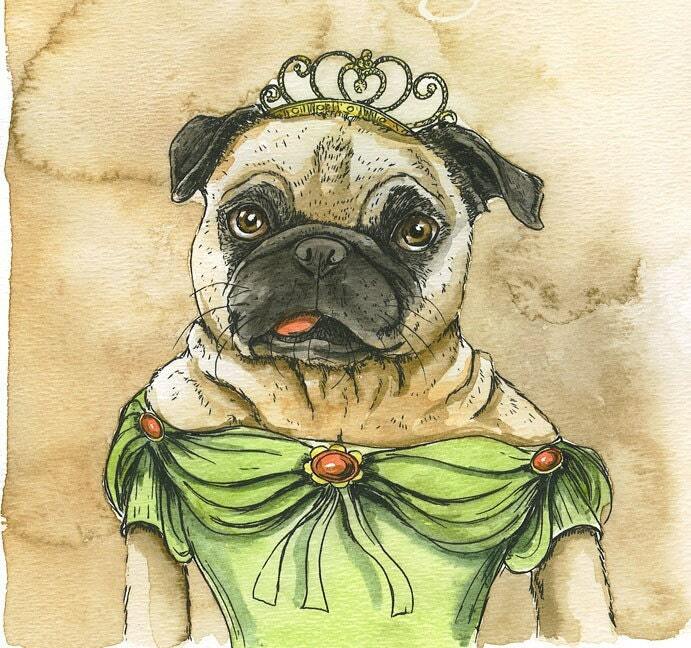 Everyone wants to feel like royalty, not excluding our domestic friends. The Poor Dog Farm shop has hundreds of prints of different animals decked out in hats and the attire of kings and queens. These satiate that need for fantasy that helps people to escape to a fanciful little world. I am obsessed by this brooch and will probably buy one by the end of the weekend. This is a great illustration printed on cotton and ready to adorn a bag, sweater, or other item in the wardrobe. Visit Marga Marina's shop for wonderful illustrations. Well, I completed a post. That is one step beyond merely creating a blog. That takes me further than I have gotten before. I am planning on visiting the Record Exchange in Salem, MA this weekend, so expect a bit on that soon. I have been in there for a quick visit once when I blew $40 on vinyl Beatles LPs that were not yet a part of my collection. I also added MJ's "Thriller" and Abba's Greatest Hits to my crates. Who knows what treasures I'll find this time. I am hoping that I will snag an album by The Smiths in good condition. That's the mission. Until next time- x's and o's.